The Department of Public Safety provides patrol officers, school resource officers and detective services to handle investigations within certain Westchester municipalities under an Inter-Municipal Agreement (IMA) with each community. With the county police providing communications and supervision from its existing resources, the arrangement enables the municipality to achieve substantial savings annually as compared to maintaining its own police department. The Department of Public Safety currently patrols the Village/Town of Mount Kisco and the Town of Cortlandt and provides school resource officers to the Lakeland, North Salem and Somers school districts. It also handles dispatching and communications for the Tuckahoe Police Department on the overnight tour. 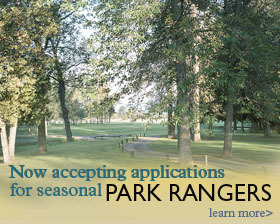 The Westchester County Department of Public Safety is accepting applications for seasonal park rangers to patrol county parks this summer. Uniformed park rangers work under the supervision of county police officers to maintain a safe and enjoyable atmosphere in the county’s parks. They assist park users, provide information on park rules and procedures, help in searches for lost children, perform basic first aid on occasion and make regular security checks of buildings and facilities. possess a valid New York State driver’s license by the time of appointment. Note: Accepted candidates must attend a 121-hour training program at the Westchester County Police Academy. "Working under the supervision of county police officers, park rangers help to ensure that Westchester's parks and pools are safe and enjoyable for those who use them." Public Safety Commissioner Thomas A. Gleason said. Uniformed officers of the Patrol Services Division (PSD) are charged with the security of the county office building in White Plains – the seat of county government – as well as the county’s Department of Social Services offices located throughout Westchester. PSD officers handle calls to Social Services housing developments including the Coachman Hotel in White Plains. Officers assigned to patrol these facilities make regular inspections and monitor the safety needs of management and clientele. The PSD regularly patrols the main campus of Westchester Community College (WCC) in Greenburgh. A college that serves over 20,000 full, part-time and continuing education students requires the same community policing efforts as a town. The PSD works with campus security to maintain order within the bustling college environment. High-profile vehicle and foot patrols by uniformed PSD officers at WCC enhance the level of safety provided by private security. Ongoing, round-the-clock patrols by the PSD continue to yield positive results and an uncompromised sense of security on the campus. While the majority of the Patrol Services Division consists of uniformed officers, the members of the Surface Transportation Unit (or Bus Detail) most often go undetected by the public but serve another county need -- the policing of Westchester’s Bee-Line Bus System. With buses operating throughout the county, serving an ever-increasing number of citizens who opt to use public transportation, the PSD utilizes plainclothes officers to address the concerns of bus drivers and passengers by blending in with bus patrons to enforce quality-of-life violations that may arise. These problems include disorderly conduct, graffiti and the use of drugs and alcohol in buses and around transportation centers and bus stops. Working with the Westchester County Department of Transportation, the Bus Detail responds to a wide array of conditions both on and off the buses. The Westchester County Parks system spans 18,000 acres and consists of more than 50 parks, nature centers, hiking and biking trails, six commercial pools, three beaches and Rye Playland, the only government-owned-and-operated amusement park in the country. The County Parks Department and its patrons rely on the Patrol Services Division to protect this vast and complex parks system. Tens of thousands of county residents and non-residents visit the parks year round, with a huge spike in attendance over the summer months. The PSD maintains patrols of these parks throughout the year and redeploys officers as well as seasonal park rangers to the parks during the summer. The presence of both PSD officers and seasonal park rangers assure park visitors of a safe and enjoyable experience. Bicycle and All Terrain Vehicle patrols are an important element of the PSD’s effectiveness within the parks and along the extensive county trailways. With special events held throughout the year in the various parks and at the Westchester County Center, the PSD is repeatedly counted on to provide and coordinate exceptional police security. The Playland Summer Concert Series, cultural celebrations, sporting events and fireworks shows are some of the many popular events that have the potential of drawing thousands of people at a time.